If Eskimos have 50 different words for snow, then Hou Hsiao-Hsien may have 50 different words for quiet. The quiet of feet crunching softly through underbrush. The quiet of a fire placidly crackling. The quiet of goats eating grass. The quiet of mist creeping over the surface of a lake. The quiet of birds chirping. And then about 45 others. Quiet is so much the predominating characteristic of Hou’s The Assassin, nominally a martial arts film, that any noises that do occur seem there to punctuate the silence – kind of like that oft-misused phrase “the exception that proves the rule.” Dialogue and score are both preciously spare. When an actual musical dance number interrupts all this quiet at one point, a desperate viewer may cling to it like a shipwrecked sailor. If The Assassin sounds difficult, it probably also sounds beautiful. Both assessments would be correct. It’s up to the individual viewer to decide if the beauty outweighs the difficulty. The plot is not particularly difficult to follow, and not only because characters repeat the core conflicts several times, comprising a significant portion of that spare dialogue. What’s most difficult, especially for a western viewer accustomed to different narrative rhythms, is to find an entry point, a way to engage with it that gives it the weight the images seem to suggest it deserves. 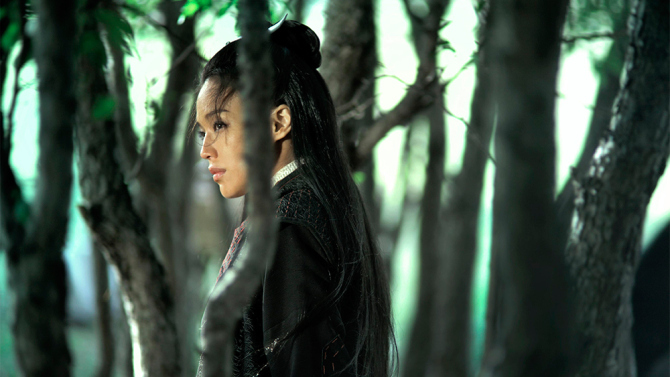 The Assassin tells the story of Yinniang (Shu Qi), a Tang Dynasty girl sent away from her village and trained into a warrior by a nun, who is also the twin sister of a beloved fallen princess from that village (Fang-Yei Shu). It’s the waning days of the dynasty and many of the outer lying villages have turned against the court, having repurposed their resources as military garrisons to claim independence from the court. 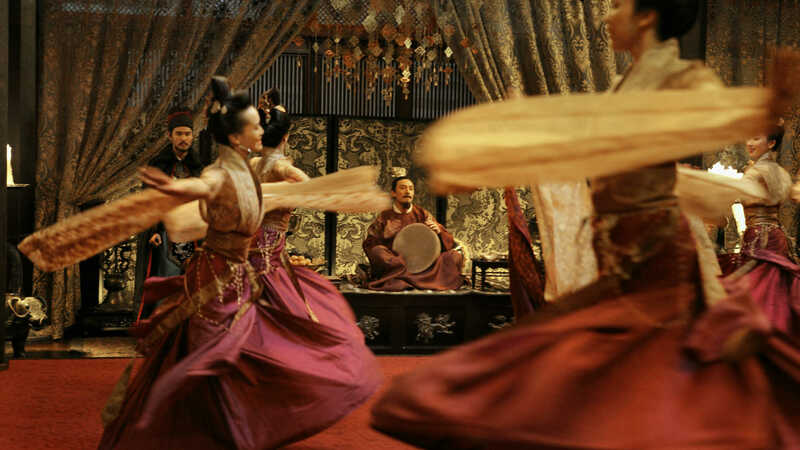 Yinniang is sent back to her village in an attempt to kill her cousin, Tian Ji’an (Chang Chen), the current military governor, who was also once her betrothed and played a role in betraying her. That princess’ dying wish was that they were both meant to inherit rule of the village, but that was not to be. The woman he did marry has given him several sons and is pregnant with another. The story surrounds the conflicts she feels in carrying out this assignment, though that’s a fairly reductive summary for the sake of brevity. All of this sounds like more than enough fodder for a good soap opera, so why is it so hard to become invested in it? Hou’s sense of quiet must have something to do with it. Instead of characters wringing their hands and demonstrating the story’s inherent melancholy openly, they speak mostly in even, matter-of-fact tones, displaying commendable stoicism but also failing to bridge that gap between character and audience member. The Assassin is so resolutely determined in its slow pace that story revelations sometimes catch a viewer’s mind wandering. Within this structure there are asides that seem devoted to little more than the enviable poetry of the images, further dampening the thrust of the story. But let’s spend a moment on the poetry of those images. Hou has collected accolades throughout his career – most recently as best director at Cannes for this film, most monumentally as top director of the 1990s in a Film Comment critics poll – for his particular visual approaching to filmmaking. Renowned for long takes and the dynamic composition within those shots, Hou does not disappoint with The Assassin. A fight scene in a forest of birch trees is the most stunning among the natural images Hou and cinematographer Mark Lee Ping Bing capture here. The sets and props are exquisitely art directed, and there’s a painterly quality to the whole enterprise that will leave a viewer’s eyes in a constant state of rapture. In one remarkable scene, the reflected light of a candle dances as its own element in the mis en scene, even though the object reflecting that light seems to be mysteriously absent. Hou also frequently shoots from behind the gossamer silk of various screens and curtains, half obscuring his subjects while also half spying on them. The story does reach a satisfying conclusion, ultimately, but it gets there through a number of breathers and circumlocutions, not all of which are the easiest to endure. Those who knew Hou was making a martial arts film, which is not traditionally in his wheelhouse, probably expected something very much like this. Those who have no preconceived notions of the director, however, may want a little … something … more.